Since 2000, Glass Impression has been the premier glass etching service for the city of Las Vegas and the surrounding areas. We are a local, family-owned and operated business dedicated to providing our clients with high quality designs and beautiful products. If you are looking for an experienced, highly skilled and reasonably priced glass etching company in Las Vegas, NV, then you need look no further than Glass Impression. 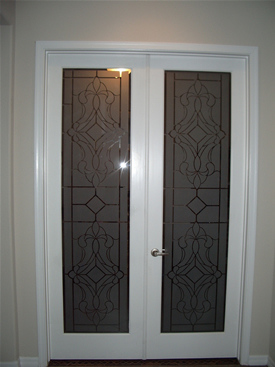 Our experts specialize in residential and commercial glass etching. We create a wide range of handcrafted designs to suit our client’s style, whether it’s Victorian, beach, Native American or Asian-inspired. When you need a decorative design for your shower, window, restaurant logo, high-end trophy or any other project, Glass Impression is here to help make your dream a reality. In addition to etching glass, we can also create beautiful designs on metal and Plexiglas surfaces. We are a local, family-owned and operated small business in Las Vegas, NV. Our services include glass etching, metal etching and more. We have been serving our community and beyond since 2000. Our styles include Victorian, beach, Asian-inspired and much more. Our etching rates are among the best in the area. Please get in touch with Glass Impression today for more information on our excellent services.